(Bloomberg) -- More than three months after Secretary of State Michael Pompeo picked Steven Biegun to lead negotiations with North Korea, the former Ford Motor Co. executive has barely met officials from Pyongyang face-to-face. 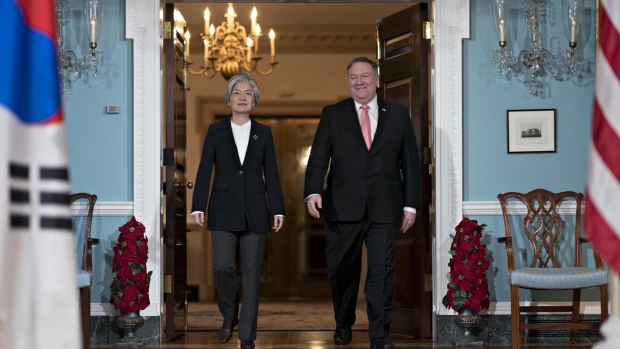 Publicly, Pompeo has remained optimistic and positive about the pace toward eventual success in North Korea. Progress “has been good” and substantive talks continue, he told CNN during the Group of 20 summit in Argentina last week. The State Department declined to make Biegun available for an interview. State Department officials say he and other officials are in “frequent contact” with North Korean leaders. While there are few public signs of progress -- amid reports that North Korea continues to strengthen and expand its nuclear capabilities while stopping short of missile launches and bomb tests -- some analysts say there may be more going on behind the scenes. They point to recent South Korean media reports that Andy Kim, the Central Intelligence Agency’s top Korea officer, met this week with North Korean officials in the demilitarized zone between the two Koreas. National Security Adviser John Bolton signaled growing impatience at a Wall Street Journal conference this week. “They have not lived up to the commitments so far,” Bolton said of North Korea. In a second summit, he said Trump and Kim are “going to discuss this and look at the commitments that were made in Singapore and have a discussion about how they’re going to accomplish those commitments."